Semi-permanent is a very popular coloring technique in the hair world. Often confused with permanent hair color, bleaching, or highlights, there are distinct differences that might make semi-permanent the best option for you. Simply put, semi-permanent hair color is a gentle and temporary alternative to permanent dye. It's the go-to option for "fashion" hair color, which gives you more of a natural hue. Semi-permanent color contains no ammonia, alcohol, or peroxide. Instead of stripping your hair, it simply deposits color. Depending on the brand, it may also include conditioners to soften and smooth your hair, fragrances to make it smell nice, and preservatives to keep the product fresh. Whether you're dying your hair at home or going to the salon, this type of hair color is much easier and faster to apply. It's renowned for being easier to use because it doesn't require any development or pre-mixing, so it can be applied straight to your hair with the applicator. This is the equivalent of four to 12 shampoos. Eight is the standard; however, it ultimately depends on how strong the dye is that you've used and how often you wash your hair. Some color is removed with each shampoo, so you can expect gradual fading. The dye won't wash out completely. There will be remnants of color in your hair after the majority of it has washed out. Semi-permanent color is also called hair gloss because it simply coats the hair with color. Unlike permanent dye, it doesn't open up your hair shaft before adding color. Hair gloss doesn't necessarily have to change the hue of your hair. It can purely add authentic luster, gloss, and shimmering light reflections to your locks causing them to look shiny and healthy. Semi-permanent dye also doesn't contain bleach. Therefore, it's unable to lighten your natural shade. Instead, it's a great way of blending in any gray hairs or enhancing your natural hue. If you did want to try and brighten your tresses, choose a color in a warm tone that's 1-2 levels lighter than your natural hue. There are many brands available that offer semi-permanent dye in a full spectrum of shades, which can both boost the hue of your tresses and correct tone when your hair has faded or has a yellowish tinge. As semi-permanent dyes fade gradually with shampooing and exposure to air, it has to be re-applied frequently to sustain color richness. Since there is a low percentage of peroxide (or none at all) in semi-permanent color, it's the kindest option to your hair. Even so, make sure that you're using a shampoo and conditioner that's specially formulated for color-treated hair post-application for extra nourishment in case of any damage. The major benefit of using semi-permanent coloring treatments is that you can experiment with various hair hues without having to commit long-term. 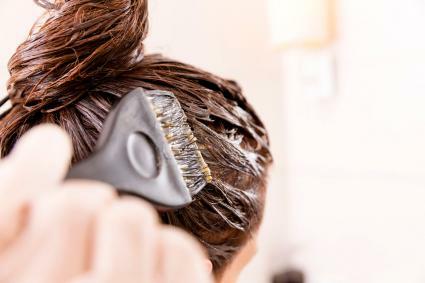 It's also easier on your hair than these other types of hair dye. Unlike semi-permanent dyes, permanent dyes require mixing of ammonia with an oxidizer (like hydrogen peroxide) and the coloring agent before application. The result is natural-looking, long-lasting hair. However, permanent dyes can be much more damaging to your locks so you should avoid coloring your hair with this type of dye too often. Bleach and highlights also remove color from your hair by oxidizing it - a very different process than simply adding color. 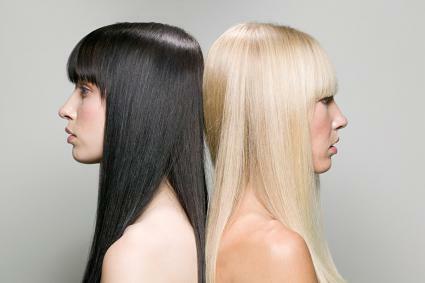 Unlike semi-permanent dye, they do allow you to try colors that are lighter or brighter than your natural shade. Ammonia-free dyes are composed of monoethanolamine (MEA), which is an organic chemical compound made from primary amine and alcohol. It's less damaging than using ammonia as it replaces the pH adjuster in other hair dyes and is also coupled with emollient oils. This will reduce the risk of breakage and protect your tresses from becoming too dry and brittle, but it's still harder on your hair than semi-permanent dye. Semi-permanent dye is one of the kindest options to your tresses when it comes to coloring them. Whether you visit a salon or do it yourself at home, try out different hues to find what works with your eye color and skin tone.